In Sri Lanka, water has played a key role in the development of the country and economic status and is deeply embedded in the culture and traditions of the people. The island is predominantly underlain by high-grade metamorphic rocks with scattered sedimentary sequences in which groundwater is considered as one of the most precious natural resources. It is also a more reliable water resource, less subject to temporal variation, and is widely used for domestic purposes, small-scale irrigation as well as for industries. Six distinct groundwater aquifers identified in the island are (a) shallow and deep karstic aquifers in the Miocene beds, (b) coastal sandy aquifers, (c) alluvial aquifers in lower reaches of river basins, (d) deeply confined aquifers in the metamorphic terrain, (e) shallow regolith aquifers of the metamorphic terrain and (f) lateritic aquifers in the south-western region. Groundwater is extracted from deep wells as well as shallow wells of which the shallow aquifers play an important role in providing domestic water supplies throughout the country. Rapid expansion of urban, rural and semi-urban settlements in recent years led to increasing stress on both the quantity and quality of water in aquifers. Both natural and anthropogenic contaminations of groundwater cause certain health problems among the population, although the relation between them is yet to be understood well. 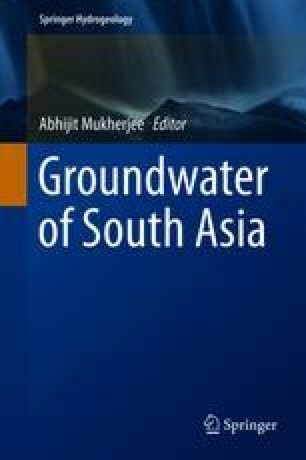 In view of the recent climate change scenario, contemporary issues on the sustainable use of groundwater in Sri Lanka need to be addressed urgently.